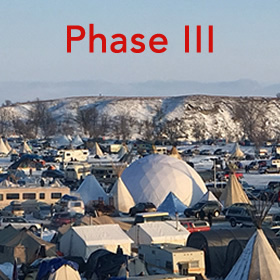 It started with the Sacred Stone Camp, set up in April to monitor the pipeline activity. Dozens of Native youth organized a spiritual run for awareness of the issue and ran 500 miles to the Army Corps of Engineers headquarters in Omaha, Nebraska. In early August construction began on the pipeline despite the fact that permits had not been granted to dig under the river. Since early August, when this small group of ‘Protectors’ stopped the construction of the pipeline, there have been thousands of Native people representing more than 200 tribes who have poured into the camp on sacred land of the Oceti Sakowin, the Great Sioux Nation near Cannon Ball, North Dakota. Red Lightning brother/musician Elijah Ray met fellow musician Kelli Love at a festival in Minnesota in late early September. She passionately shared of her experiences of living for several months at Standing Rock with her yound child. Elijah was totally moved and began reaching out to various people for support. One of them was Brad Nye, a co-founder of Red Lightning. What unfolded in just over two weeks time was nothing short of extraordinary. Amplifield.com committed to and then hosted a Global Online Synchronized Prayer on Saturday, October 1 with live sound transmission by Elijah Ray. Over 600 participants from around the world joined the prayer in a powerful show of solidarity and intention setting.